The waterfront has several boats docked at the marina in Thunder Bay. The aerial view shows the city of Thunder Bay with its many buildings and roads lead to the waterfront on Lake Superior. A few trees are scattered among the city and the marina. Marina and waterfront in the city of Thunder Bay, Ontario, Canada. Please let me show you more of my pictures from my "photo gallery: Thunder Bay Photos". 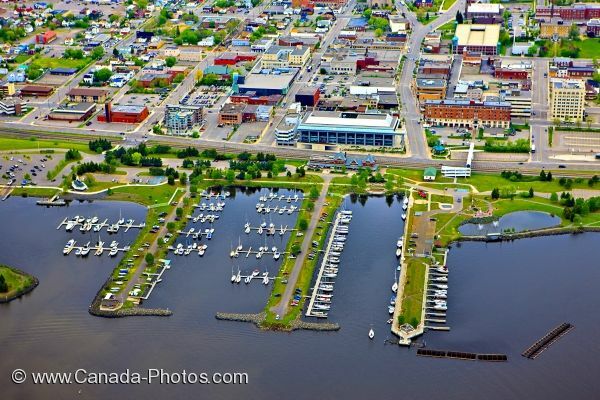 Aerial view of the marina along the waterfront of Thunder Bay, Ontario, Canada. Pictures from photo gallery "Thunder Bay Photos"